Combining an extensive Theme Park experience with Yorkshire’s favourite Zoo, plus a fully featured Resort Village, this unique destination provides great days out, fantastic short-breaks and truly memorable holidays! The UK’s most visited zoo (Visit England) with 140 species and all the kids’ favourites in the Muddy Duck Farm collection. You can enjoy a truly amazing view of the animal kingdom in the heart of North Yorkshire. What’s more, with regular handling sessions and talks by zoo keepers, there’s sure to be something that’ll capture your imagination. This brand new Park Adventure allows you to design your own fun in the trees at Temple Newsam. Choose from a variety of aerial routes, mix and match crossings and explore the forest canopy. Then fly to the ground by zip wire or take The Plummet straight down! Level two adventurers will get all the fun of level one plus can challenge themselves to loop four. Climb through a Fisherman’s Trap to take on a whole new series of high-wire crossings. 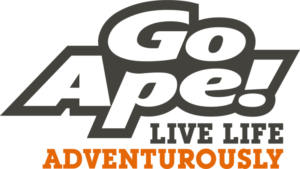 Participation and supervision ratios apply – see goape.co.uk for more details. For more details and to book click here. Take on a day out packed with thrills, chills and adventure at Lightwater Valley Theme Park. With over 40 rides and attractions for thrill seekers of all ages, Lightwater Valley Theme Park is bursting with adventures for the whole family and an exciting line up of events for 2017! Try Nordic Skiing, explore and interact in the Giant Yew Tree Maze and glide over the Real Ice Rink, against a beautiful Yorkshire countryside backdrop.